The world`s most famous silver coin. Maria Theresa succeeded her father, Charles VI, in 1740 at the age of 23. Her father had tried to guarantee the female succession through the Pragmatic Sanction, although Prince Eugene of Savoy believed he would have done better to have left her an efficient army and a full treasury! She was Queen of Hungary and of Bohemia, Archduchess of Austria (the title of Empress came in 1745 when her husband, Francis Stephen, was elected Holy Roman Emperor), and she defended her lands and rights courageously in the War of the Austrian Succession against Frederick of Prussia and his allies. Internally her reign was marked by great reforms in the areas of justice, finance, education, agriculture and medicine. Maria Theresa created the foundations of the modern state. Her marriage to Francis Stephen of Lorraine was a love-match. She bore him 16 children. Francis Stephen was an able businessman, but had little in the way of political ambition. Even after he became the emperor, he preferred to leave the business of governing to his extremely capable consort. He died in 1765 and was succeeded by his son Joseph II, who now became the frustrated co-regent with his mother, Maria Theresa. The silver taler was the currency of the Empire and of the Austrian hereditary lands. The silver taler was very important for trade with the Levant (parts of Turkey, Lebanon, Syria) and the Maria Theresa Taler became the best known and most popular silver coin in the Arabian world. After the death of the Empress, Joseph II permitted the mint at G�nzburg (today in Bavaria, but at that time Austrian territory) to continue striking with the 1780 dies in order to meet the demand from the Middle East. The 1780 taler was the only silver coin that the Arabs trusted and would accept. Thus began the long minting history of the "Levantine Taler" of the Empress Maria Theresa. Since then the G�nzburg taler has been restruck for trade purposes at Vienna, as well as at mints in Prague, Milan and Venice from time to time. The taler became the unofficial currency of some of the lands in North Africa, and it can still be found today in many Arabian bazaars. This version of the taler became so important that it was restruck even in London, Bombay, Paris and Rome. The "Levantine Taler" lost its status as legal tender in Austria in 1858, but thanks to an imperial edict of 1857 as well as the present laws of the Austrian Republic, the mint at Vienna still produces this famous trade-taler down to the present day. The obverse has a portrait of the mature Empress. She wears a widow`s veil (which was reduced in order to meet Arabian demands) and a brooch with nine pearls. The inscription "M. THERESIA D.G.R. IMP. HU. BO .REG." translates as: Maria Theresa, by the grace of God Roman Empress, of Hungary and Bohemia Queen. Below the bust one finds the initials "S.F. ", which stand for the names of the two G�nzburg mint officials in 1780, Tobias Sch�bl (S) and Joseph Faby (F). 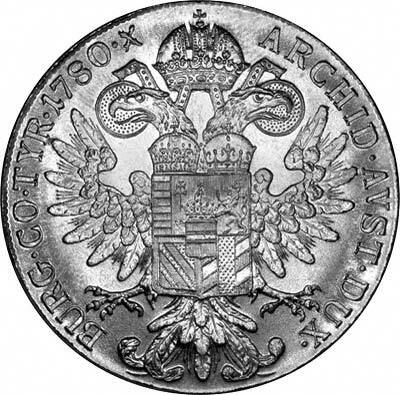 The reverse shows the imperial double-headed eagle with the arms of Austria at the centre, surrounded by four quarters representing Hungary, Bohemia, Burgundy and Burgau (G�nzburg). The inscription reads "ARCHID. AUST. DUX. BURG. CO. TYR. 1780" and translates: Archduchess of Austria, Duchess of Burgundy, Countess of Tyrol, 1780. The raised edge of the coin has the motto of the Empress "Iustitia et Clementia" (Justice and Clemency) with various ornaments. 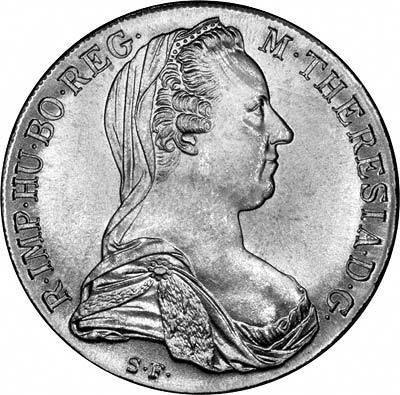 The story of the Maria Theresa Taler is undoubtedly unique in the history of money and numismatics. It is not only one of the most beautiful silver coins in the world, it is also the most famous and most widely spread. The Maria Theresa Taler belongs in every collection because of its special history. It is, however, also a gift of unusual interest and a souvenir of lasting value! According to Krause, there have been an estimated 800 million Maria Theresa thalers struck since 1780. Strangely enough, since we included this page on our website, we keep getting offered large quantities from the middle east. We wouldn't normally wish to cast doubt on the accuracy or honesty of the people who contact us, but most of these sellers (or their agents) claim to have very large quantities for sale. Most own a few million, one agent claimed to be acting for two vendors, one of whom owns one billion, and the other owns two billion coins. Since each of these two gentlemen owns more than were ever minted, it makes us wonder! Needless to say we don't bother to reply to such enquiries unless the vendors wish to establish their bona fides with us in advance. Clear evidence of the wide circulation of these thalers can be seen in countermarked emergency issues, such as those for Mozambique in 1889.